Posted on August 31, 2018. Filed under Association News. Be the first to comment. 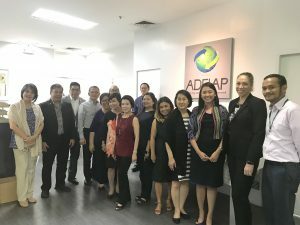 ADFIAP met with officers of the World Wide Fund (WWF) in the Philippines https://wwf.org.ph/ on August 30, 2018 at the ADFIAP Headquarters in Manila, Philippines to discuss potential areas of collaboration on sustainable finance and other synergistic cooperation opportunities. Discussed during the meeting, among others, are the possibility of developing capacity-building programs and conferences on environmental social and governance (ESG), environmental and social management system (ESMS), and environmental and social risk management (ESRM), which would offer long-term performance advantages and financial benefits to banks and other financial institutions. The World Wide Fund for Nature (WWF) is an international non-governmental organization founded in 1961, working in the field of the wilderness preservation, and the reduction of human impact on the environment. Attending the meeting for WWF are Kate Philp, Edgardo Tongson, Tieza Mica Santos and Joseph Eijansantos. ADFIAP was represented in the meeting by the its strategic business units – the Asia-Pacific Institute of Development Finance (IDF), ADFIAP Consulting (AC), and ADFIAP Finance Investment Center (AFIC).